Even for the Caribbean, Puerto Limon's beaches are something very special, perhaps because the tentacles of tacky tourism haven't taken hold yet. Right along the 125-km / 78-mile stretch of Puerto Limon province's coastline are white sands, azure waters, coral reefs and isolated coves. Although there are no actual beaches in Puerto Limon that could be considered suitable for swimming and surfing, there are a number nearby that lend themselves to water sports. The Playa Bonita is especially close, being just 4 km / 2.5 miles to the north-west and coming with good beachfront amenities. Offering a reasonable stretch of sand, the Playa Bonita is known for its reef break and strong waves, which are ideal for surfing. 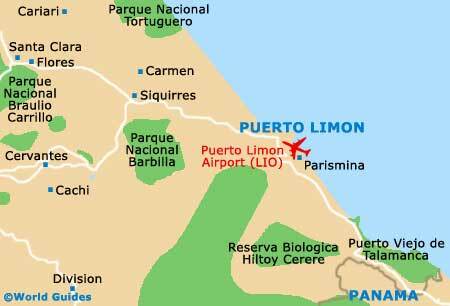 To the north of Puerto Limon is Portete, which boasts a charming bay and dark sand, and is particularly popular with the local Costa Ricans. Portete Beach (Playa Portete) is a notable spot for snorkelling, since the waters are nice and clear, and there are a number of reef communities fronting the coastline. Also close by Puerto Limon are the beaches of the Isla Uvita, which lies just 1 km / 0.5 miles off the coast and is well connected by boats from the pier. The Isla Uvita has become known as something of a surfing hotspot and comes with epic waves. Further afield is Tortuguero Beach (Playa Tortuguero), which is famous among naturalists as a breeding beach for the endangered green turtles. April through October is the breeding season and this beach is the species' last remaining major site for hatchings.